October wasn’t quite the month I was hoping for, but my body got the rest and recovery that it needed. Here are some of my highlights from October. Mom came down and spent a weekend with us. It was fun to relax, eat good food, and visit Reiman Gardens while she was here. I got to run with my sole sister at the Run for the Roses 5K, although that only lasted for the first mile since she was so much faster than me. She is so strong and speedy! Run for the Roses is always better with friends! The Iron Hippie ran the Des Moines Marathon, so I took my bike down and chased him around the course! It was fun to cheer him on to another finish line! The Iron Hippie getting close to the finish of the IMT Des Moines Marathon…I’m so proud of him only 5 weeks post Ironman Wisconsin! Boys in the Boat by Daniel James Brown is a MUST READ! Wow! The obstacles these 9 men had to overcome to make it to the 1936 Berlin Olympics is not only inspiring, but also unthinkable! All of this happening as Hitler was starting his attempt to take over the world without the world knowing it. So many things that are hard to wrap my brain around, but the boys never gave up, fought for their spot on the US Olympic team, worked hard and overcame obstacles to chase their dreams! My Coeur Sports Teammies have been inspiring me for the last 2 years! Watching them chase their dreams as they conquered Kona, Louisville, Maryland, and North Carolina lit my fire even more to chase my dreams and turn them into reality! 2017…I’m comin’ for ya! How was your month of October? What were your highlights for October? It is no secret…I love endurance sport! The question to ask would be where did this passion come from? I did not grow up participating in sports…unless you consider cheerleading a sport. My parents were not athletic role models. My sisters did not participate in sports. So, where did this passion for endurance sports come from? 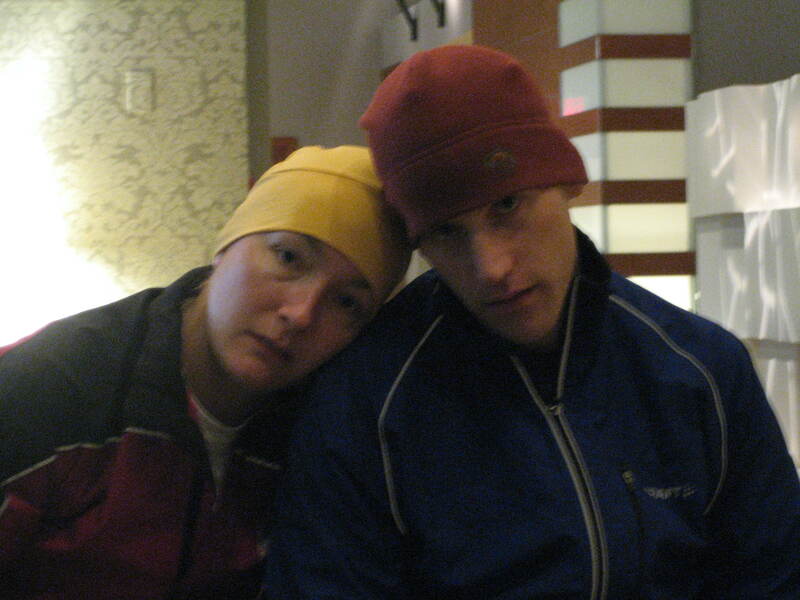 In 2004, I went through a divorce and made a drastic decision…I was going to run the Dam to Dam 20K race. I was not a runner. I was determined that I was going to run 12.4 miles. WHAT WAS I THINKING?!?!?! 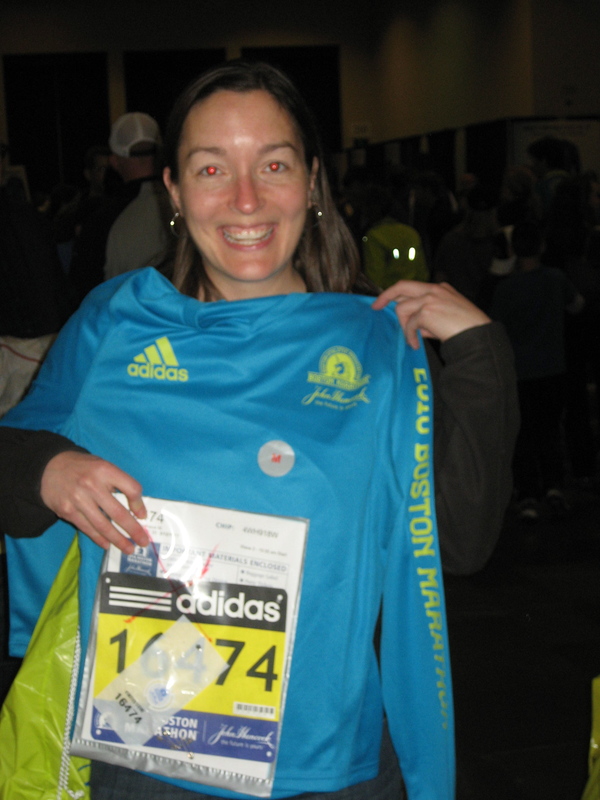 It turns out my mind knew something my body didn’t…I started running and I was hooked! You could say I transformed into Forrest Gump just a bit…I ran that 20K and then decided I was going to run a marathon and then a few more marathons. After crossing the finish line of multiple marathons, it was time to try a sprint-distance triathlon. I grew up swimming, I knew how to ride a bike (although my bike at the time was definitely not a bike to race with) and I had been running consistently for a few years. Crossing that finish line of my first sprint-distance triathlon was amazing! I was on cloud nine and was riding the endorphin train! I decided it was time to take on a more challenging distance, so I opted for an Olympic-distance triathlon before trying my cards at a half-Ironman distance triathlon. But why stop there?!?!?! How about the Ironman-distance triathlon???? Could I do it? Again I thought, “WHAT WAS I THINKING?!?!?!? !” But after crossing that finish line, I was hooked! So what hooked me in endurance sport? As a life-long-learner, I find satisfaction in trying to solve a problem. How do I become a better athlete? 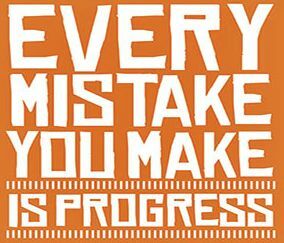 What have I learned from my mistakes? How have I grown into a better person through all of this? The variety in training and racing…I love not doing the same thing every day. Finding balance in life is sometimes difficult, but triathlon gives me balance in my workout schedule and prevents monotony. I thrive on pushing myself to new limits…I want to see just how far I can go and what I can do. Getting comfortable with the uncomfortable is always something I push myself to try and achieve. Overcoming challenges is so rewarding…when I do something that once seemed impossible, the feelings of self-worth, self-confidence, satisfaction, pride, and happiness are beyond amazing! I love the feeling of success…when I finish a tough workout, when I cross the finish line of a race, when I conquer my fears, when I do the impossible. I thrive on structure…having races on the calendar gives structure to my racing, having workouts in Training Peaks gives structure to my weeks and months, having structure gives me focus. 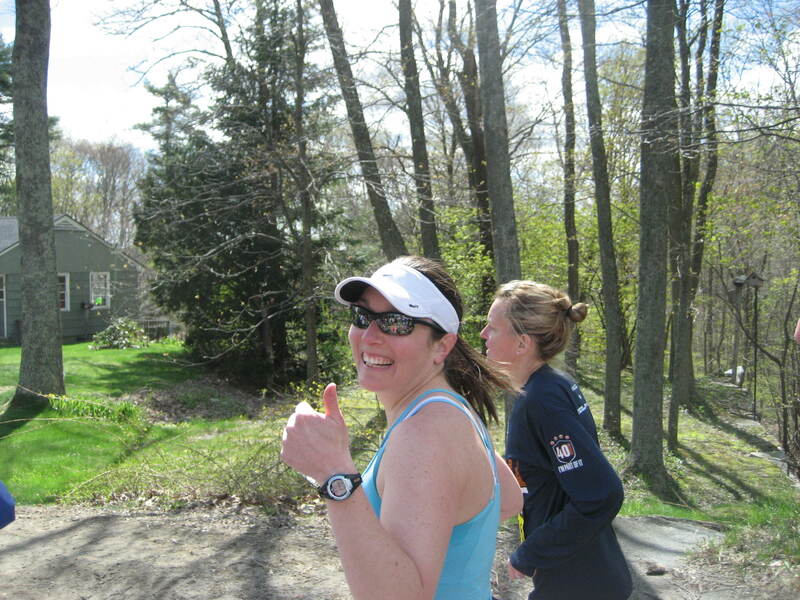 This smile sums up how I feel about endurance sports!! 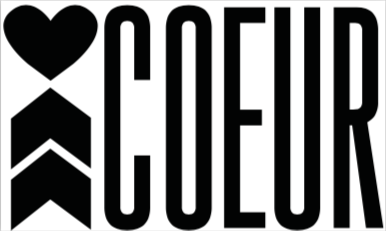 I am beyond blessed and lucky to be a part of the Coeur Sports team again in 2016. I share the same mission as Coeur Sports. 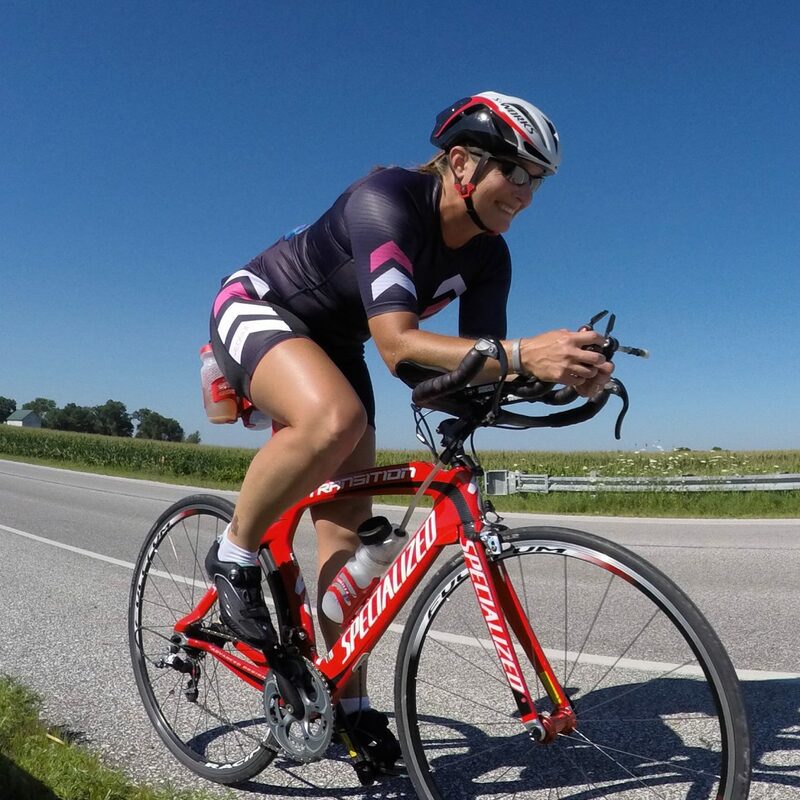 Our mission is to share our passion with other women and enCOEURage them to participate in endurance sports. I want all women to love endurance sports as much as I do! I want to see women’s triathlon, swimming, cycling, and running grow into epic numbers! I want to inspire more women to experience the happy heart that I experience when I SBR! I. Love. Endurance. Sports! What is your favorite endurance sport? What hooked you in endurance sports? How do you share your passion for endurance sports with others? Sunday, September 13 was Ironman Wisconsin. We have been going to Madison for Ironman Wisconsin weekend since 2010…on the years we are not racing, we volunteer and help out the athletes racing. 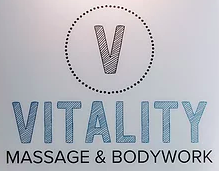 It is such an amazing experience…surrounded by inspiration, motivation, positive energy, like-minded people, drive, determination, passion, courage, bravery, fortitude and a multitude of other positive and uplifting feelings and emotions. This year, our intentions were to volunteer at the “Morning Clothes Bags” area and then cheer on friends throughout the day. On Saturday, a friend of ours (Kari is the co-captain for the women’s change “tent”…both T1 and T2) asked me if I could help her out in T1 and T2. The captain of the women’s change tent is fighting stage 4 cancer and is in a LOT of pain. She made the decision not to come to the race venue on Sunday, so Kari needed help. I knew I had to step up and spend my whole day volunteering instead of going out on the course and cheering on friends. Kari needed me (since she was taking on the role of captain on race day) and I knew all of the women athletes would benefit from having me in T1 and T2. Sometimes being flexible is necessary. Race morning in front of the Capitol. When we volunteer, we wake up just as early as we do when we are racing. We made our way to the swim start area by 5 am on Sunday morning to help set up the “Morning Clothes Bags” area and get ready for all of the athletes to make their way to the swim start. Race morning…who is ready to swim?!?!?! At 6:45, I quickly made my way up the helix to view the swim start from the top of Monona Terrace and then made my way into the women’s change “tent” for T1. Who’s going to be an Ironman today?!?!?!?! T1 is ALWAYS INSANE…so many athletes coming through at about the same time and all needing help changing and getting ready for the bike. This typically leads to one volunteer trying to help 5 (or more) athletes at a time. All athletes need to cross the timing mat into T1 by 9:20 am. This gives them 2 hours and 20 minutes to complete the 2.4 mile swim. For some athletes that do not make this time cut-off, the volunteers take on the role of counselor. Thankfully, this did not happen in the women’s change tent on Sunday morning. After sending over a 1000 women out on the bike, we moved and organized their T1 bags putting them in numerical order so their T2 and morning clothes bags could be attached to them before athletes/sherpas could pick them up after 6 pm. At 11 am, I grabbed a quick bite to eat at The Great Dane, went back to our home stay to shower and then made my way back to Monona Terrace by 1 pm to prepare for T2. The afternoon change is never as crazy as the morning change. The women are more spread out in the afternoon, so we typically have one volunteer to one athlete…on a rare occasion, 2 athletes to 1 volunteer. The athletes are in a much different head space coming off of the bike than they are when they exit the water. Volunteers in T2 become cheerleaders, motivators and counselors more frequently than they do in T1. Some athletes are still in great shape (both physically and mentally) coming in off the bike and are ready to go run a marathon. This is when the volunteers take on the role of cheerleader and continue to feed positive energy to the athletes as they go out for their run. Some athletes come off their bike so exhausted that they don’t want to go on. This is when the volunteers take on the role of motivator, reminding the athletes why they are here and encouraging them to continue on. Other athletes don’t make the bike cut-off of 5:30 pm and are told their day is done before they come in to T2. This is when the volunteers take on the role of counselor, listening to their story, giving them a shoulder to cry on and reminding them that they are NOT a failure. Once our shift was over, I had to run some lost and found items to the information tent near the finish shoot and return some timing chips to the finish line for athletes that withdrew or did not make the time cut-offs throughout the day. At about 7 pm, I finally made my way back to the condo we were staying at to eat some leftover Thai food for dinner. It was at this point that the Iron Hippie and I decided we would be driving home Sunday night instead of waiting until Monday morning. Our logic was…all of the athletes we had come to cheer on had already crossed the finish line, so if we stayed up until midnight, we might as well sleep in our own bed and have all day Monday to regroup at home instead of spending half of the day driving back. Without further thought, we loaded the Rav and hit the road, pulling into our driveway shortly after midnight. 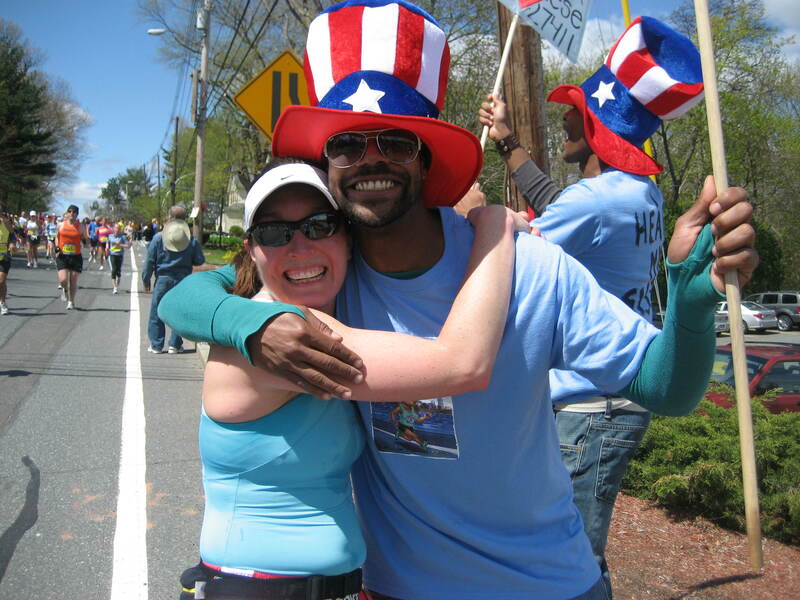 Do you have a race/event that you love to be a part of every year (racing and/or volunteering)? If so, what is it? Why do you take part in this event? 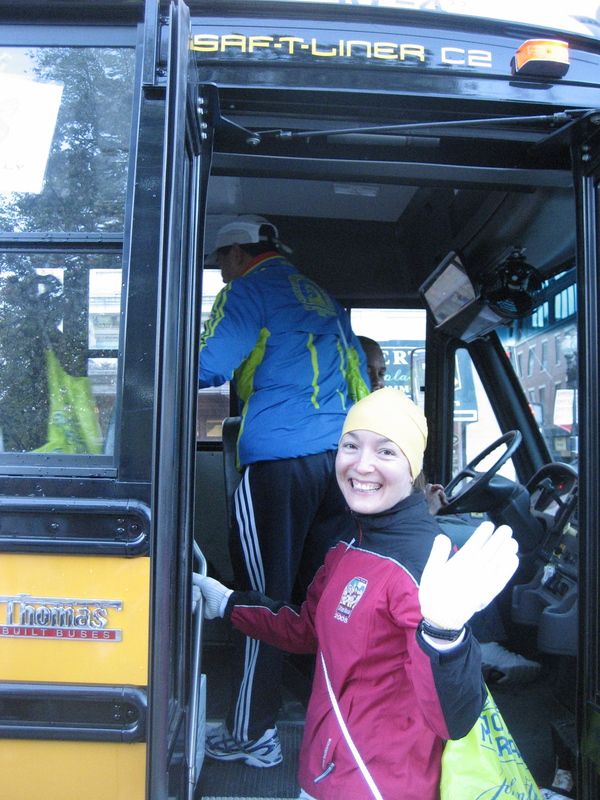 What is the furthest you’ve traveled to volunteer/spectate at a race? 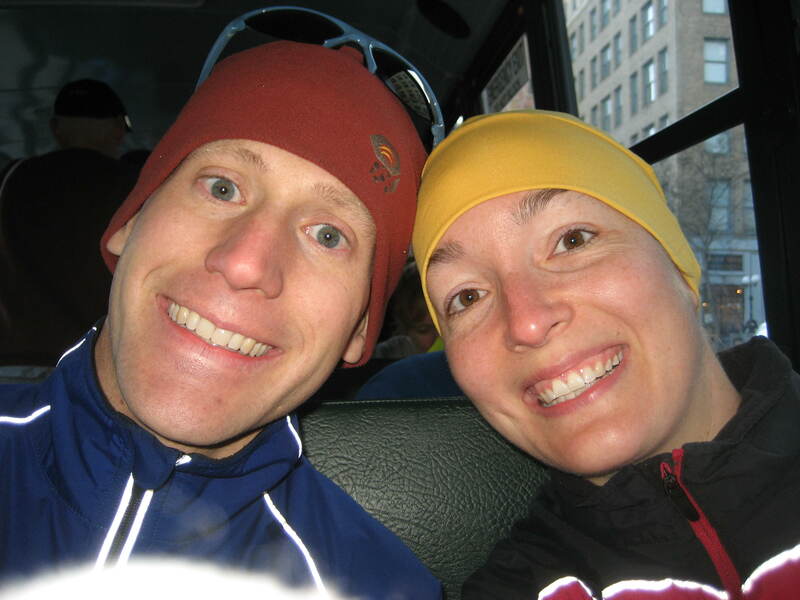 In October of 2008, I ran the Milwaukee Lakefront Marathon with the Iron Hippie by my side. 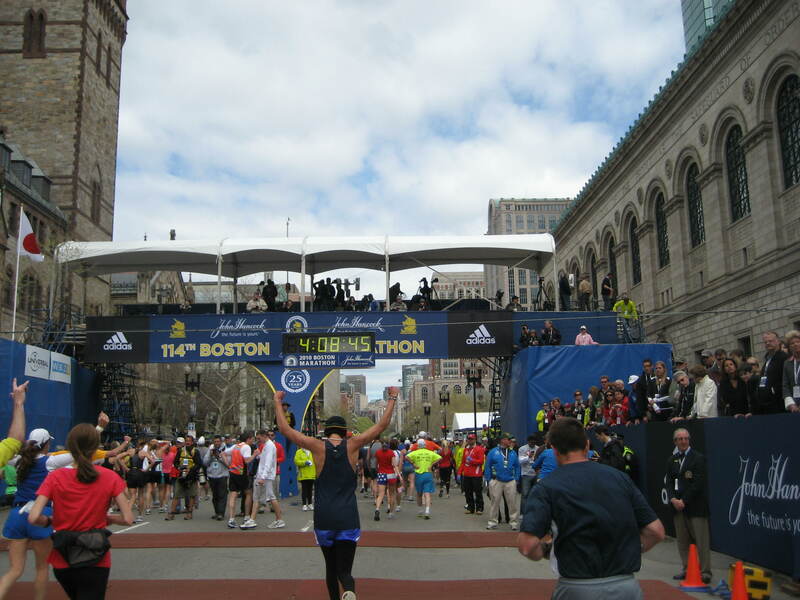 We crossed the finish line in 3:39:46, qualifying me for the Boston Marathon by 1 minute & 13 seconds (at that time, I needed 3:40:59…this was before all of the new qualifying times and new registration process). 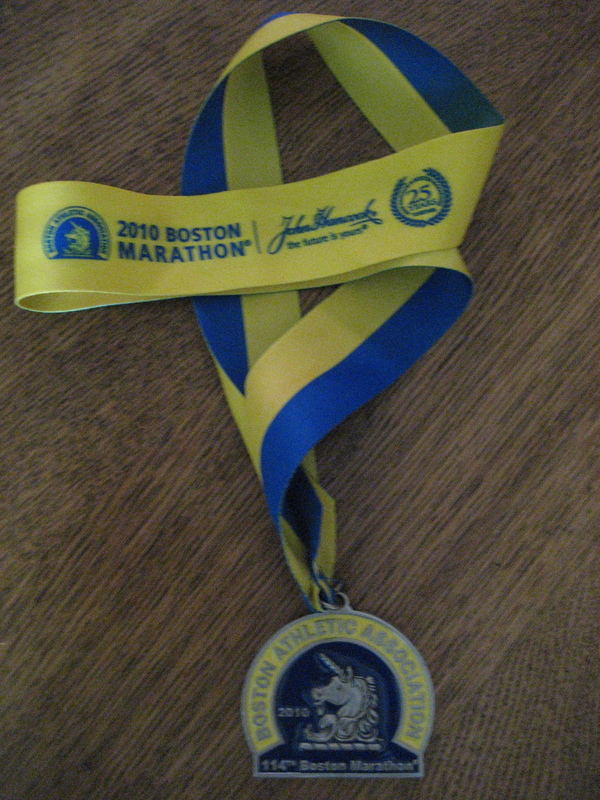 I decided I would wait to run the Boston Marathon in April of 2010. I had already signed up to run a few more marathons at the start of 2009…Rock ‘N Roll Arizona Marathon in January, Green Bay Marathon in May and Grandma’s Marathon in June. 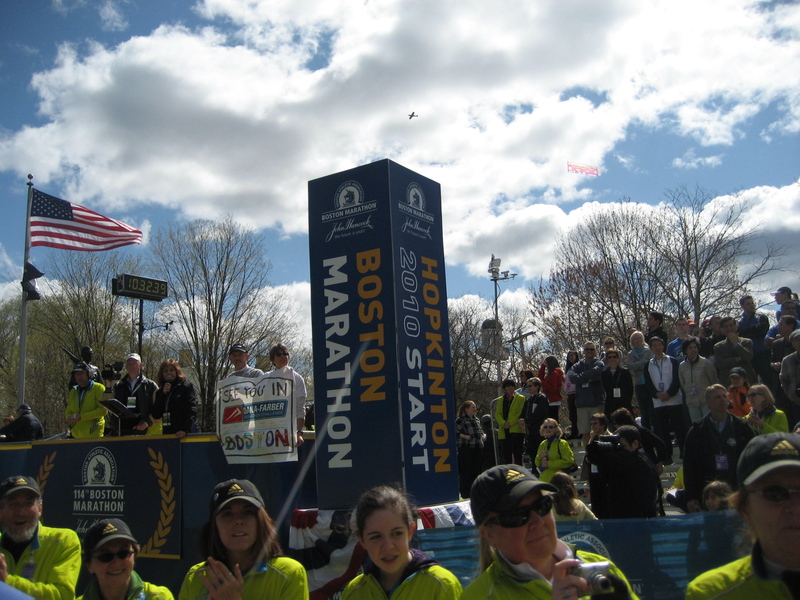 Holding off to run the Boston Marathon in 2010 would probably be the best option. 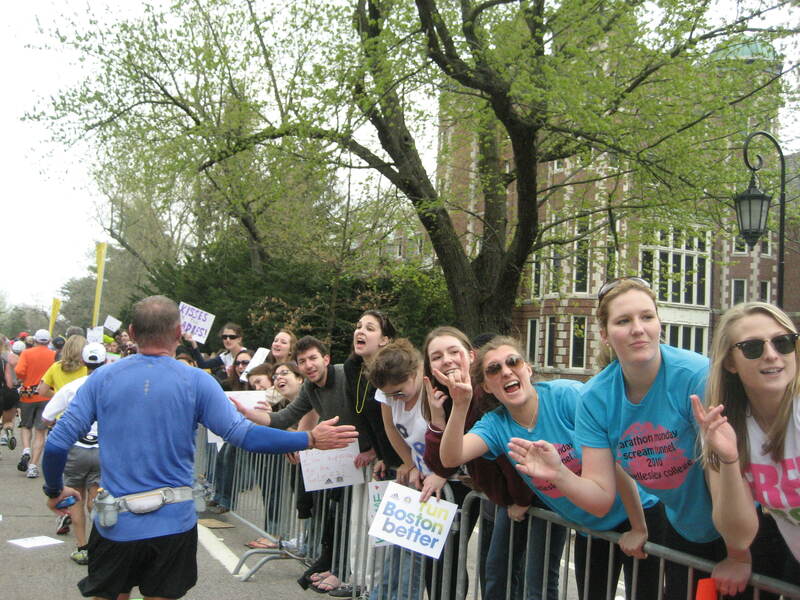 By the time the 2010 Boston Marathon rolled around, I had made the decision to run the race just to have fun. I was going to carry a camera, take lots of pictures and not worry about trying to finish within a specific time frame. I busted my tail to get to this race, and I was going to enjoy it!! The day before the race at the expo picking up my race number. Our friend Mike and I getting ready to go catch a bus out to Hopkinton…it is way too early for this!! Mike and I on the bus out to Hopkinton…there is no turning back now!! 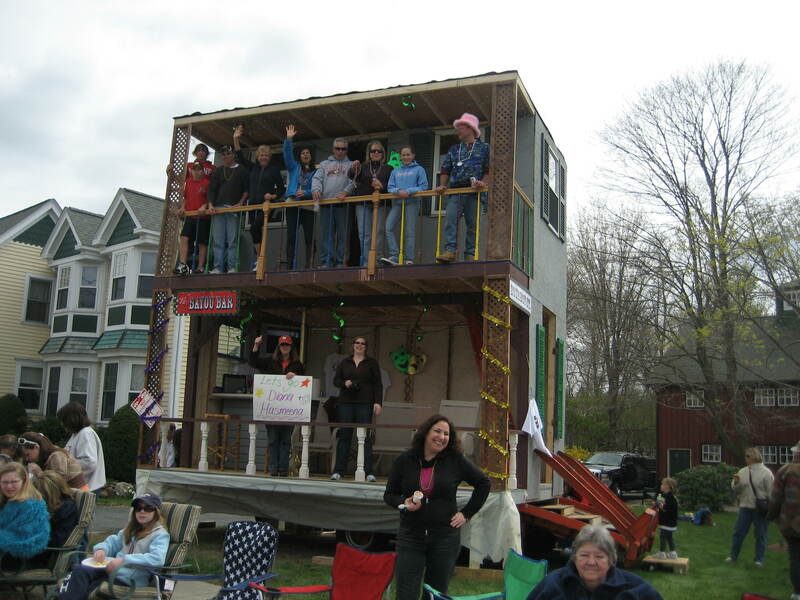 A Mardi Gras float on the race course…and yes they were throwing beads down to the runners. 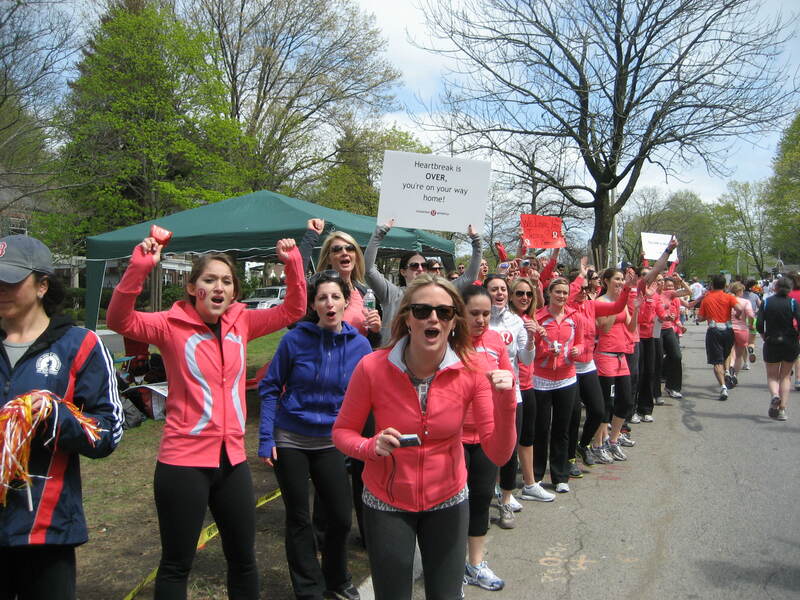 Wellesley Girls College…oh boy can they scream!! Ear plugs would have been a good investment for this stretch. You could hear them scream a mile away!! 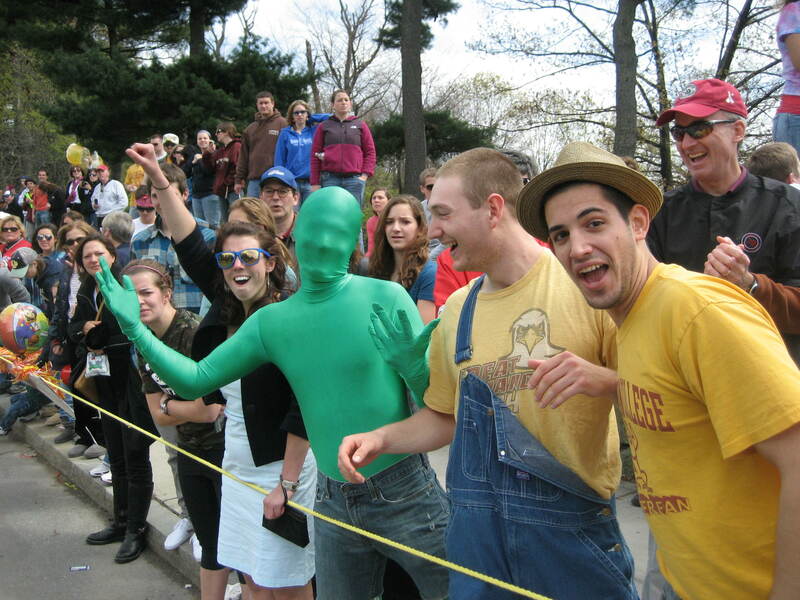 A completely green spectator…that must have been difficult to see through. 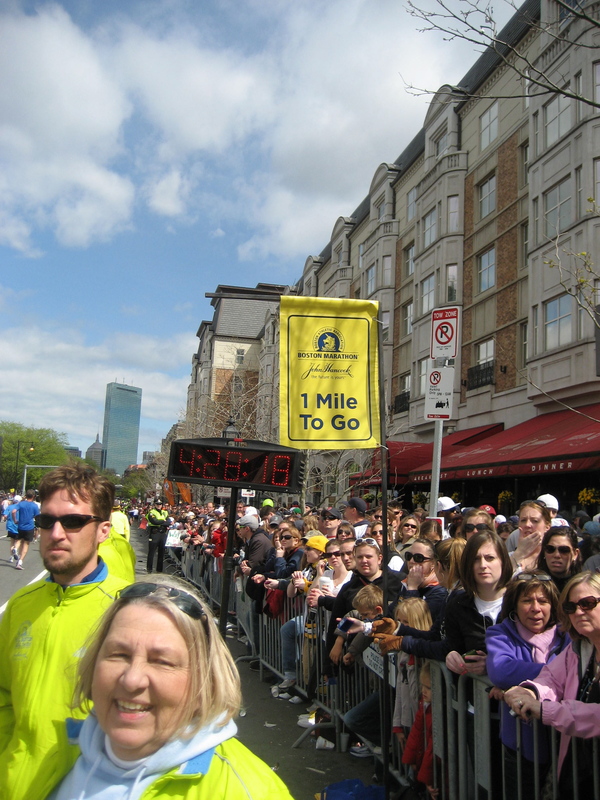 Finally…the infamous “Citgo” sign near the finish line. 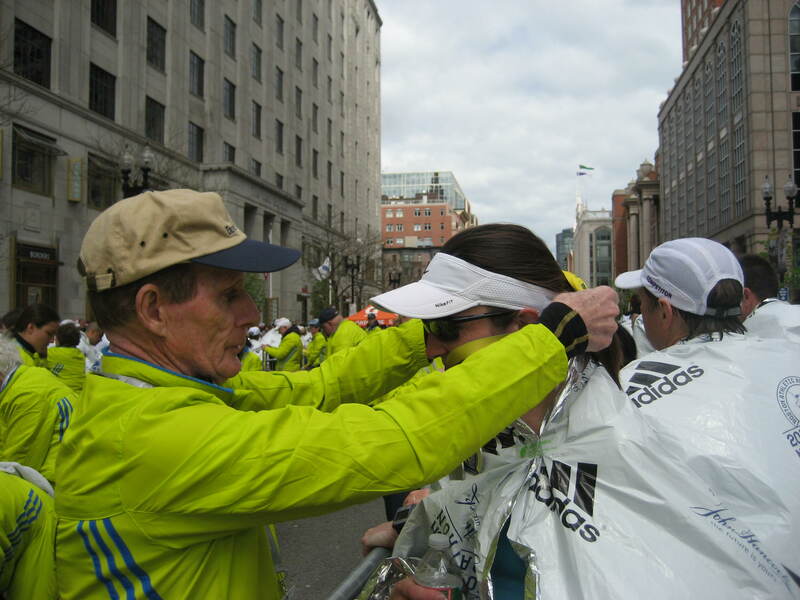 A volunteer putting my race medal around my neck at the finish line of the Boston Marathon. 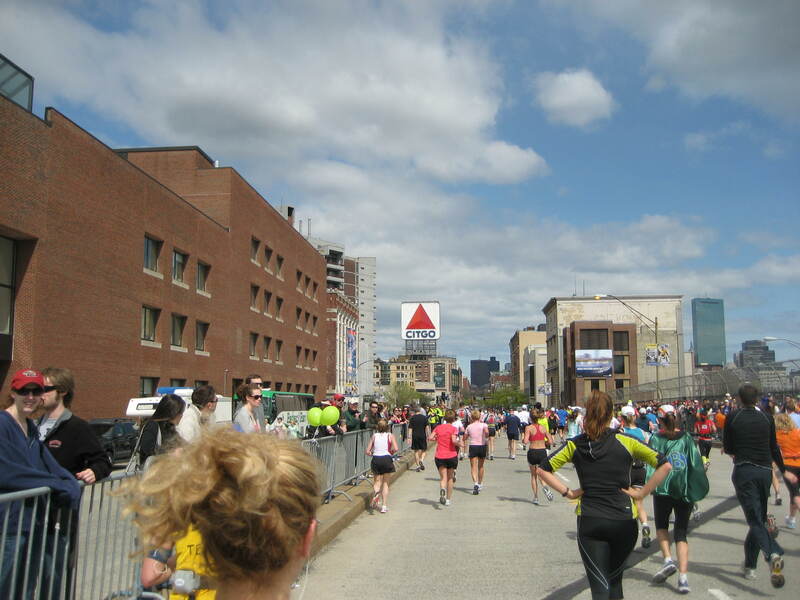 Have you run the Boston Marathon? If so, what was your favorite part of the race? As many of you know, I am again training for IRONMAN Wisconsin. I participated in IRONMAN Wisconsin 2011 and crossed the finish line, but in a less than desirable state. As a result, I feel it is important to look back on my experiences from my IMWI race day in 2011 so I don’t make the same mistakes again. What was my biggest mistake??? Hyponatremia…a condition when the sodium in your blood is abnormally low. 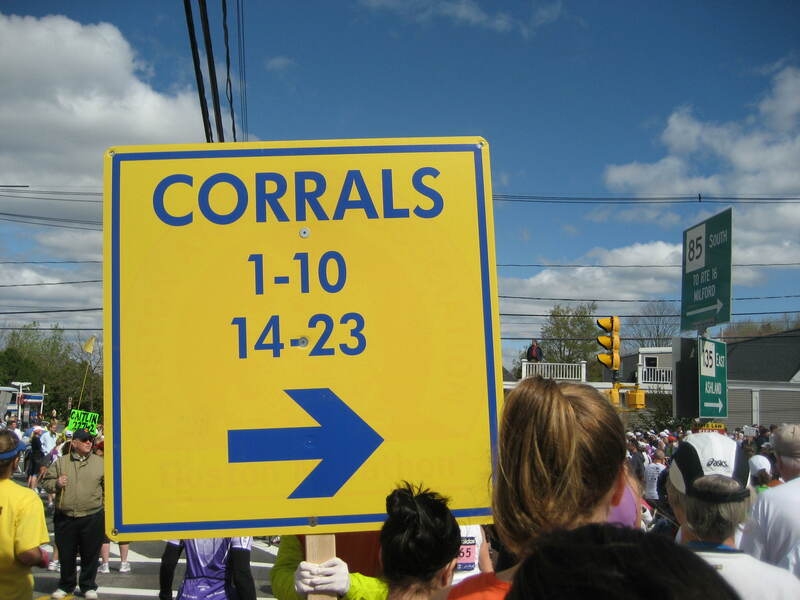 While anything can happen on race day, I don’t ever want to relive hyponatremia. On race day, it was sunny, 84 degrees with wind speeds as high as 16 mph from the SW. While this isn’t ridiculous midwest summer weather, it was warmer than I had planned for. I drank plenty of water…a little too much actually. I didn’t take in enough salt tablets or salty foods while on the bike. I finished the race, but I don’t remember the last 90 minutes on the bike or the entire marathon (which I mostly walked…6 1/2 hours). As a matter of fact, I don’t remember much until about 1 pm the next day and what I do remember is foggy…imagine getting completely intoxicated, waking up the next morning and having spotty memories from the night before wondering if “that really happened” or if you are imagining it. Too much water can be a very bad thing. Many of the symptoms of hyponatremia and dehydration are the same, which can make proper diagnosis difficult. I did not have enough sodium in my nutrition plan on race day at IMWI 2011. I need to develop a different nutritional plan for IMWI 2014. I need to practice with a variety of fuel sources. 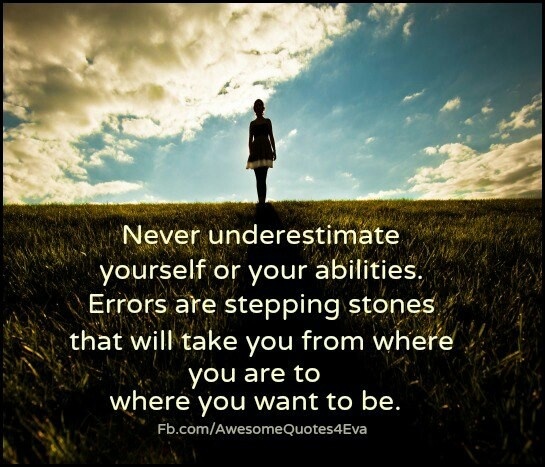 What will I do differently in 2014? I will try to incorporate solid food while on the bike. In 2011, I only used liquid calories (Carbo-Pro), which did not contain much salt and I did not do a good job on race day of supplementing with salt tablets. I am starting to practice with these now while on the trainer to see how my stomach responds to them. This will give me about 7 months to practice and adjust as needed. I will try a variety of fuel sources during training and smaller races throughout the year…I am not going to stick with only one fuel source this year. I do know that I am lactose intolerant and anything with whey protein upsets my stomach, so I will need to avoid fuel sources that use whey protein. I do know that I need more sodium than what I used in 2011. If I continue to use Carbo-Pro, I will need to supplement it with salt tablets or additional fuel sources containing sodium as Carbo-Pro does not have sodium in it. I do know that my body does not respond well to caffeine (accelerated heart rate, excessive sweating, twitchy muscles, etc. ), so I will need to find fuel sources that do not have caffeine in them. I do know that I have struggled with solid foods on the bike in the past. For some reason, my body struggles to digest the food and it feels as though someone has put jagged rocks in my gut. I am willing and not afraid to try solid foods again and hopefully find a solution or two that will work. Finding a nutritional plan (with back-up options) will be an ongoing experiment for me this year…good thing I am a science teacher and enjoy a good experiment!! What struggles have you encountered while racing and how have you overcome them?